My second 'N' word for this challenge at The Craft Barn. And just found Simon Says Stamp has a nautical challenge - just a coincidence so might as well link there as well. 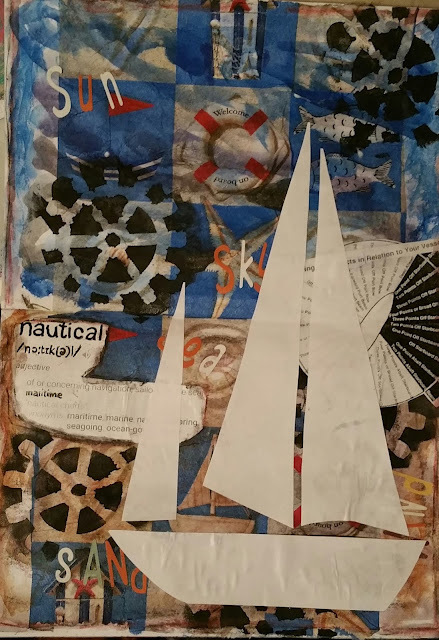 I had tried out a background using salt, with no success so used these pages with a sea/nautical themed napkin to create this page. WOW. That background is great, but the boat steals the show. What a great way to illustrate your second chosen word for this challenge. Thanks so much - and that boat is just copy paper! Wow! How genius are you to use a NAPKIN for this project? I would've never thought to do that, but I love how it turned out! The background reminded me of a beautiful patchwork quilt or collage and I love how the boat on top is a pristine white. You did a wonderful job on this piece and I'm so glad you shared your talents with us for this week's Simon Says Stamp Monday Challenge! Thanks very much Andrea. I knew it needed something on the top and when I looked at some images of yachts I suddenly thought just white would work. Keep it simple to go with the busy background. The simplicity of the boat against the busy background is a perfect combination.